This episode of the hit TV series Bananas has your complete daily dose of laughter. Nazareth is hilariously clever with his outsider's point of view on everyday situations in America! 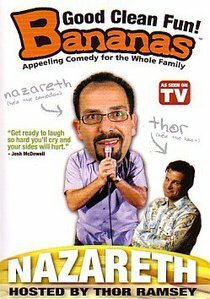 Bananas is more than just stand up, it's interviews of the not-so-serious kind as well as some hilarious unscripted moments caught on tape. Laugh along as Nazareth pokes fun at all the crazy "choices" we have to make. Plus, his trip to the doctor will leave you in "stitches!" Comedian Nazareth is sure to produce an outbreak of infectious laughter! Best of all, it's contagious fun for the whole family!